Rising Stars! is a Challenge created for early learners. 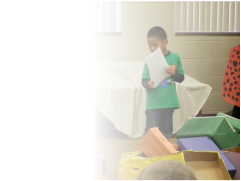 To solve the Challenge, 4- to 7-year-old children work together on performances complete with characters, props and scripts. Learn about maps and how they are helpful to people. Create a play that is about a journey your team is on. Make a change in direction at some point during your play. Make a map to help your team on your journey. North, south, east , or west. Hmm...which way is best? Roy G. Biv had a birthday party, in which many of his animal friends came to see.